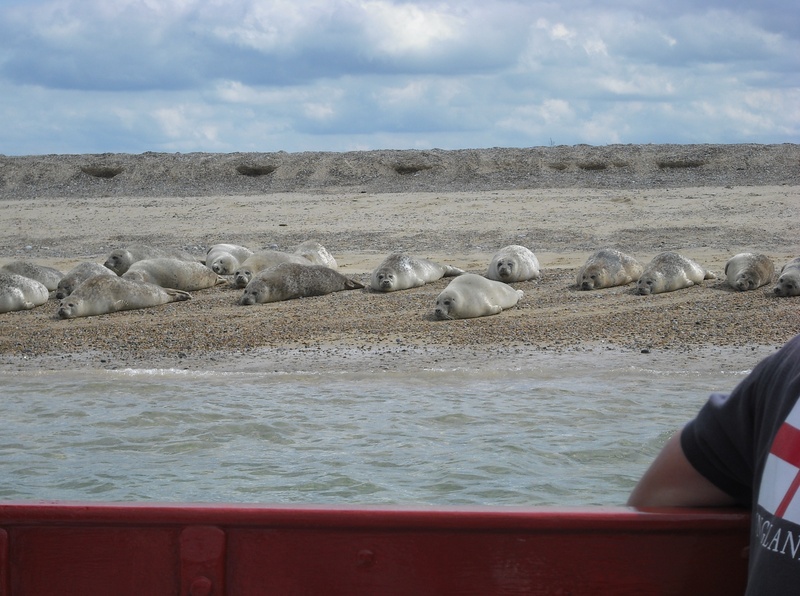 There are still a couple of weeks left of the seal-watching season at Blakeney in north Norfolk. I took a trip out with Bishop’s Boats in early September, accompanied by my husband, mum and two dozen other tourists armed with cameras and cardigans. We ploughed through the chilled grey North Sea for around 20 minutes before the captain dropped the engine on the clinker-built boat and we drifted towards an islet of dunes with sparse tufts of green hair. At first I thought the bank was piled up with sand-coloured rocks but as we bobbed closer I realised the rocks had faces. And fur. And flippers. There were dozens of seals basking on the bank, some fat, some compact, some slick from swimming, each one watching with black liquid eyes to see whether we’d venture any nearer. We didn’t; the boat companies operating from Blakeney are sensitive to the seals’ habitat and our skipper had asked us not to disturb their peace. Instead everyone took photos and pointed out individual seals that caught their interest. “Look, that one’s yawning” or “He’s got grey whiskers, like an old man”. A toddler in pink spotty trousers remained wholly uninterested in the entire spectacle, preferring instead to scramble up the life-ring mount and slide down again on her nappy-padded bottom. Two girls in red kayaks did paddle too close to the seals, though, and suddenly hundreds of awkward bodies lumbered and shuffled and splashed into the sea, the water magically endowing them with grace and speed as they dived in and over the shallow waves. Catch them if you can: www.norfolksealtrips.co.uk.